Chandana Vangapalli came up with a methodology to help quantify the environmental, social and economic benefits of AT&T’s Smart Cities’ solutions. 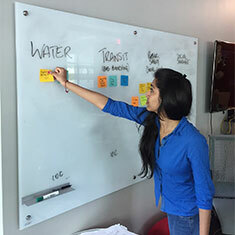 EDF Climate Corps fellow Chandana Vangapalli worked with AT&T to develop a method for quantifying the successes of its Smart Cities initiatives as it pertains to environmental sustainability. Chandana was tasked with coming up with a methodology to measure and capture the sustainability and citizen benefits in support of the company’s 2025 goal– achieving carbon savings 10X the footprint of its operations. Chandana helped develop a framework to measure the successes of the AT&T Smart Cities initiative, which is rolling out in several key U.S. cities this year. Included were methods for quantifying the benefits of reducing emissions across these spotlight cities and calculating the energy, water and cost savings that will be achieved through initiatives like smart lighting, energy management, water management, mass transit and waste management. She also created a blueprint for a dashboard that can capture the impact on three dimensions: environmental, financial and citizen welfare. Chandana’s work will help improve the holistic tracking and communication of the impact smart city solutions will have in our communities. It can also help the company further demonstrate its value as a strategic consultant and trusted advisor when it comes to building smarter cities. Chandana Vangapalli is an MBA candidate at UNC Kenan-Flagler Business School. She is a former badminton player, a trained dancer and an avid reader. Prior to UNC, she worked as a consultant for energy and utilities, giving her an experience that helped to streamline her career goals towards sustainability.